Democrats have made it clear that once they take over the House in January 2019 that their “Resistance” will ramp-up to an all-out war on President Trump and the conservative agenda that won him the presidency in 2016 and grew the Republican Senate majority in 2018. House Republicans are faced with a problem all too many of them never really thought about going into the 2018 election: Who should lead us in the war Democrats have declared on President Trump and traditional America? Should it be the current House leadership whose failures and broken promises cost us the majority, who stymied President Trump’s agenda and, in many cases, stood silent or even joined in when President Trump was attacked? Or should it be someone who kept their promises, fought for the conservative agenda and traditional values and defended President Trump when he was attacked? 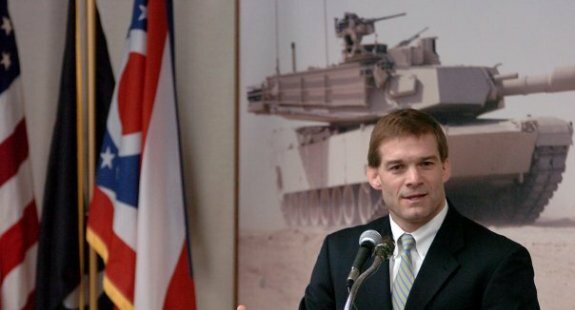 From our perspective if the House Republican Conference wants to fight their way back to the majority, then a wartime leader is needed, and that wartime leader is Representative Jim Jordan of Ohio. For many conservatives the fact that Jordan is not a member of the failed Paul Ryan – Kevin McCarthy leadership team may be all they need to know. But from our perspective there are other, more practical reasons to back Jim Jordan, and the first one is something that no one in the establishment media is talking about or will talk about. And that is that Jim Jordan and the Freedom Caucus were winners in the 2018 midterms, while Kevin McCarthy and the rest of the Ryan leadership team were losers. Of the eleven limited government constitutional conservative candidates that the Freedom Caucus targeted and that Jordan, Rep. Mark Meadows and the other Freedom Caucus members campaigned for, all eleven won. Contrast that record of success with the disaster visited upon Republican candidates by Ryan, Majority Leader Kevin McCarthy and their National Republican Congressional Committee Chairman Rep. Steve Stivers, where even candidates in solid Republican districts were outspent 2 to 1, or more, and lost because they were told to campaign on local issues and tax cuts instead of nationalizing the election on the Trump agenda. The second is another factor that the establishment media isn’t going to talk about, and that is the breach of trust between the existing House Republican leadership and the grassroots of the Republican Party. Pre-election surveys by five conservative grassroots organizations showed their members overwhelmingly support Rep. Jim Jordan to lead House Republicans. It is not surprising that surveys would show grassroots conservative would want new leadership in the House after suffering through the RINO leadership of John Boehner and Paul Ryan, but the level of demand and support for Jordan was a near 90 percent, or more, in every poll. In the FreedomWorks poll of 4,200 members reported by Michael W. Chapman of CNS News, 99.2% (4,203) said they support Rep. Jim Jordan for Speaker vs. 0.08% (32) that support Rep. Kevin McCarthy (R-Calif.) for Speaker. McCarthy currently is the House Majority Leader. “When we first saw the results of this poll, we were shocked," said FreedomWorks President Adam Brandon. "We knew our grassroots favored Rep. Jordan for Speaker, but we had to double-check to make sure that wasn’t a typo." Things were little different in the Tea Party Patriots poll analyzed by Mr. Chapman. The Tea Party Patriots, which has more than 3 million members, found that 98.4% of its supporters would like to see Rep. Jim Jordan as the next Speaker. “Since the birth of the Tea Party movement, our supporters have consistently demanded two things – that our political leaders keep their promises, and that they act in Washington the way they act back home, when they’re running for reelection,” said Jenny Beth Martin, the honorary chairman of Tea Party Patriots Action. “Jim Jordan is one such leader,” said Ms. Martin. MRC Action, the grassroots army of the Media Research Center, also polled its members, reported Mr. Chapman. From the 2,552 responses, 96.5% said they would like to see Rep. Jordan as the next Speaker of the House. According the analysis of Michael W. Chapman, the survey further showed that 96.2% believe Jordan is the better pick to support President Trump's agenda compared to Rep. Kevin McCarthy (3.8%). As for a better leader to enact a conservative agenda, 96.3% picked Jordan over 3.7% for McCarthy. The Club for Growth polled a sample of more than 3,800 members of its 250,000-member network. According to Mr. Chapman’s analysis, the results showed that 95% prefer Jordan and 5% prefer McCarthy. “Jordan’s massive margin of support reflects the disappointment economic conservatives have in the current House Leadership,” Club for Growth President David McIntosh told Chapman. “The Leadership failed to keep its campaign pledges to fully repeal Obamacare and control government spending." ForAmerica, a digital conservative grassroots army of 8 million people, also polled a sample of its members. ForAmerica asked, "In a matchup between Rep. Jim Jordan and Rep. Kevin McCarthy, who is your choice to be the next Speaker of the House?" More than 4,800 members responded: 86% picked Jim Jordan and 14% picked Kevin McCarthy. "After taking the pulse of the grassroots, it is clear they want change in GOP leadership given the current leadership’s abysmal failures on key conservative campaign promises," ForAmerica President David Bozell told Michael W. Chapman. "Failure theater has become the norm on Capitol Hill and the list of broken promises from Congress is a mile long and growing." "There is a thirst for new blood in leadership, and for someone who knows how to take on the power structure in Washington – and Jim Jordan fits the bill," said Bozell. Submitted by oldtimefarmers on Fri, 11/09/2018 - 14:37. I just got off the phone with Jim Jordan, he was responding to a message I'd left him on his phone. I told him I was in the middle of reading an article about "Jim Jordan for Minority Leader" on Richard Viguerie's site ConservativeHQ. In the conversation he said he was a long shot but that he was trying. It sounds to me like he needs our help NOW! Spend an hour of your life calling the ten GOP congressmen whose phone numbers you were given by conservativeHQ in an email over the past few days. Put in an effort like your freedom depends upon it...because it very well might.